If you’re going to be doing any sort of training with a heavy bag, then you need gloves. It’s that simple. In fact, you need decent heavy bag gloves to protect your hands from injury. With that in mind, we’ve put together a round-up of what we think are the top 10 best boxing gloves for heavy bag use. 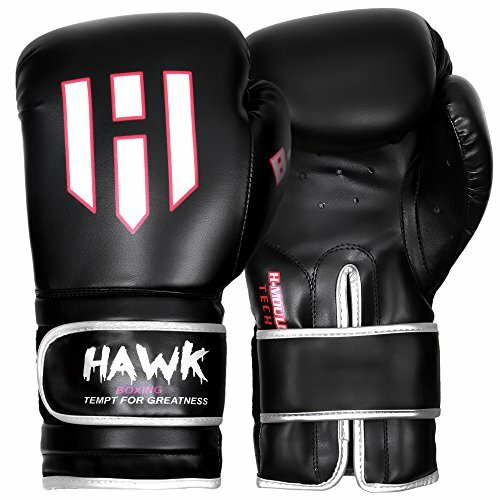 Although not explicitly billed as “heavy bag gloves” these gloves are perfectly suitable for heavy bag use. They come in at a very affordable price, which means that you have to set your expectations accordingly, for example there’s no proper wrist wrap, instead you get a wide elastic band at the base of each glove. You can, of course, add your own wrist wrap and this works fine for many people but those with particularly slim hands may wish to look elsewhere. That detail aside, however, these gloves offer excellent value as they are well-padded and over perfectly respectable build quality. Ignore the MMA bit, heavy bag training is heavy bag training regardless of what sport you’re training for (if any). 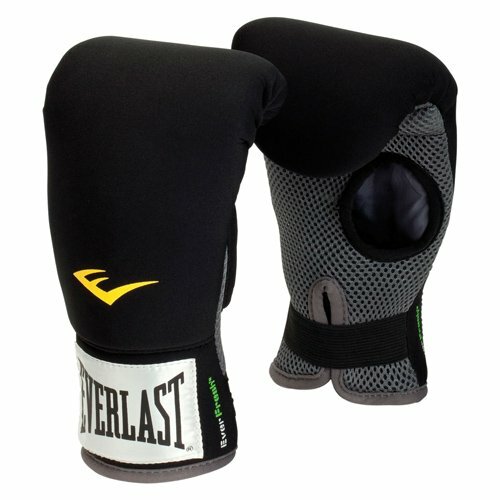 The key fact of the matter is that these gloves offer the sort of solid value for which Everlast has become renowned. Unlike the Contender heavy bag gloves above, the Everlast heavy bag gloves do have a wrist wrap and hence may feel a bit more reassuringly snug on slimmer wrists. They also have an open thumb, which seems to be a matter of taste. Some people love have their thumb free and others say it makes them feel vulnerable. 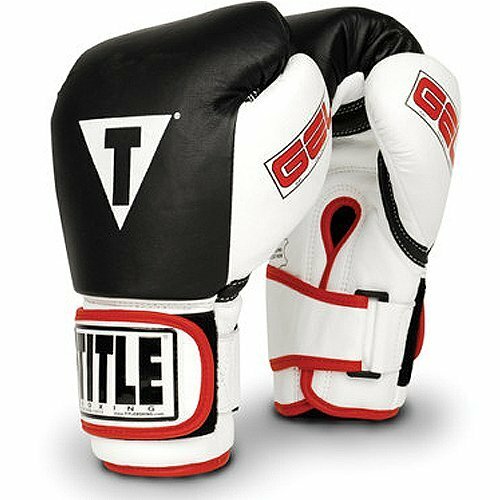 If you’re in the former group, these heavy bag gloves are definitely worth a look. 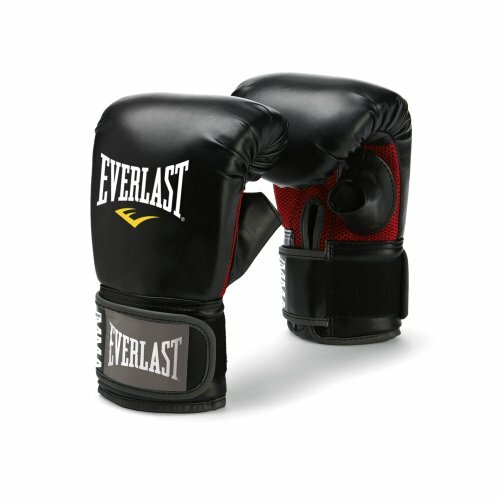 These heavy bag gloves are another solid value offering from Everlast. Like the Contender gloves, they use an elastic strap rather than a proper wrist wrap, but this plus the open thumb means that they are very easy to slip on an off, which appears to be the general idea. There’s plenty of padding, particularly for the fingers and especially the knuckles and the use of mesh over the palm helps to allow sweat to escape and to keep your hands nice and cool. Even though the description looks like it’s been written more for search engines than for humans, these are actually really good heavy bag gloves, in fact (in our opinion) they’re just as good as heavy bag gloves which cost a whole lot more. If we had to pick out one feature we particularly liked about these gloves, it’s the fact that they slide on and off really easily, but once they are on, the high-quality wrist wrap makes sure they stay on. In fact, we’d especially recommend these gloves to people with slimmer wrists, who might have had trouble getting other gloves to hold snugly. We’d also like to say we do appreciate it when manufacturers offer gloves in more than one colour, for the simple reason that it makes it a bit easier to identify who owns what gloves at the gym. Also, we rather like the freshness of the white version. 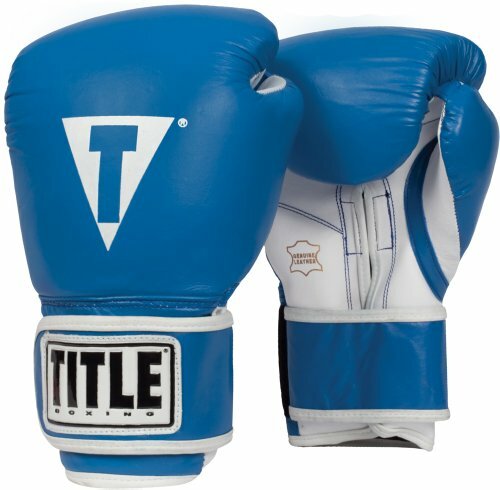 These gloves have excellent padding, so you can really give a heavy bag all you’ve got and the stitching will stand up to plenty of abuse. There is a breathable lining to deal with sweat and the ThumbLok feature offers a bit of extra safety. Gel Infused & Multi Layered V-Impact Foam: Reduces the chance of injuring your fists. 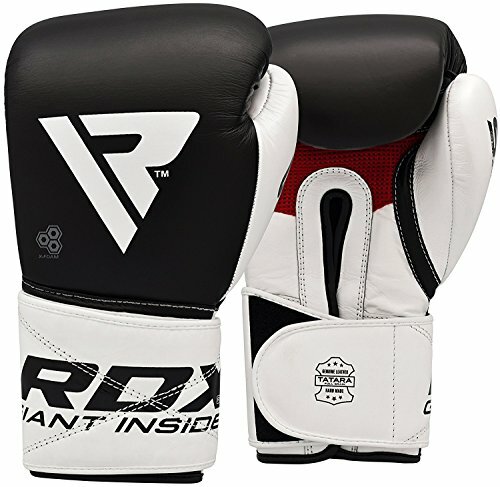 It has to be said that the sizing on these heavy bag gloves is on the small side, so basically if you do go for these heavy bag gloves, buy two sizes up from what you think you’ll need. Other than that, these are very comfortable gloves with a proper wrist wrap, plenty of padding, a mesh palm and a semi-open thumb. Speaking of the mesh, you can get it in grey or yellow, which we think is a nice touch. The headline benefit of these heavy bag gloves is that they are machine washable and we’ve even heard of them being put in tumble dryers although we’d assume this was on the lowest heat setting and not something we’d try ourselves (even though these heavy bag gloves are a very reasonable price). We do, however, appreciate just being able to throw these in the washing machine. 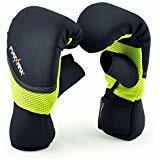 Ignore the keyword-laden description, these are excellent heavy bag gloves, in fact, in our opinion, they’re far better for heavy bag work than they are for sparring because they are quite hard. 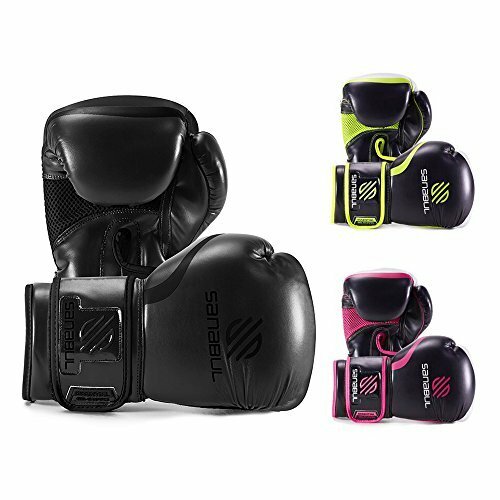 They are also superbly tough on the outside and exceptionally well-padded on the inside so basically, you can throw all your weight into your punch and know that your hands will be effectively protected. In addition to the padding, there’s also a special lining in the hand area to whisk away sweat and help to keep your hands cool and dry. The other key point about these gloves is that while they do have a wrist wrap, it works a little differently to your standard one, again, you either like it or you don’t. Overall, we’d consider these gloves to be on a par with gloves over twice their price and we’d consider them to be an excellent, long-term investment purchase for people who know that they’ll be committed to training for at least two or three years to come. An inner lining and mesh system expels heat, absorbs sweat and keeps hands ventilated and cool. In spite of the name, these are actually black gloves with yellow highlights, which do look rather stylish (in our opinion) but are definitely not golden by any stretch of anyone’s imagination. The name is a reference to the Golden Gloves of America, Inc which aims to promote boxing in general and the safety and development of young athletes in particular. 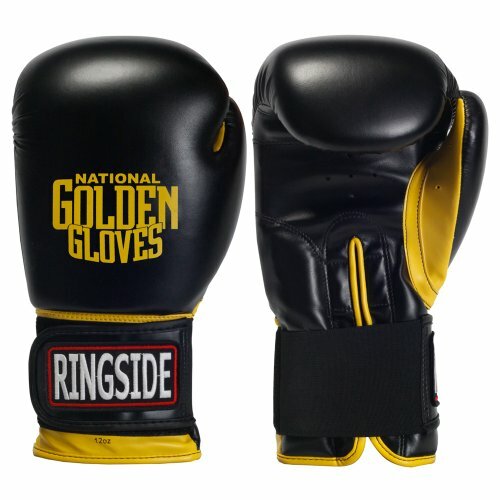 Ringside donates some of the profits from the sales of these gloves to that organization. Fortunately, these heavy bag gloves have more than just a connection with a worthy cause going for them. They are solidly built on the outside and have plenty of padding on the inside. The wrist wrap does its job well and the inner lining feels comfortable as well as protective. The “Essential” line is Sanabul’s entry-level line and prices reflect this, but what it means in practice is that products are absolutely fine for general forms of training such as the heavy bag, but if you do decide to move ahead with kickboxing, then you’re probably want to move on up. These gloves are decently strong on the outside. We doubt they’ll stand up to years of use, but by the time they wear out, you’ll probably be happy enough to upgrade anyway. There’s plenty of gel padding on the inside and a mesh palm both of which kept to keep your hands safe and comfortable. Rather impressively for this price point, these gloves have a proper wrist wrap (rather than an elastic strap) and it does its job very well. There’s also a women’s version of these gloves, although there are plenty women use the standard version perfectly happily. These gloves are tough on the outside, well-padded in the middle and with a lovely, comfortable lining on the inside. As you’d expect from gloves of this quality, the lining is breathable to help keep your hands dry and comfortable. These gloves will stand up to some serious pounding and will give your hands outstanding protection. If we had to name one feature about these gloves which we particularly liked, it’s that the wrist wrap is a bit longer than usual, which makes life a whole lot easier for those of us who do up our gloves ourselves and need to use our teeth for the second one. We also like the fact that they’re available in different colours, which helps with quick identification at the gym. 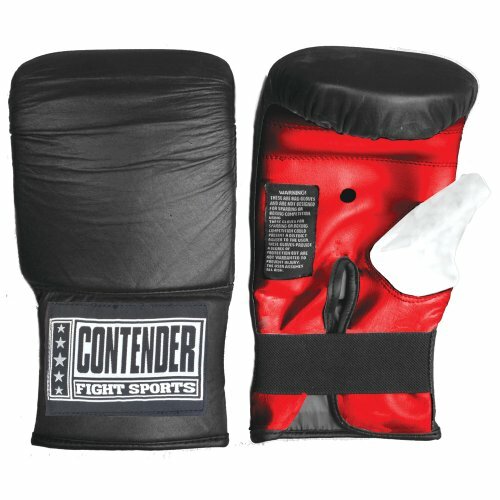 If you have the budget and you’re serious about training, then these could well be the heavy bag gloves for you. We couldn’t say that you’ll never need to buy another pair, but it will probably be a while before you do and by that we mean years. Hit that heavy bag as hard as you like, these gloves can take it. The outer material and stitching are built to withstand some serious abuse. You’re hand won’t feel it either, as it will be safely behind plenty of high-quality padding and a comfortable, breathable liner. Speaking of comfort and just for the record, trust the TITLE fitting chart. When you first get your hands in these gloves, you’ll probably find them a little tight. That’s because (just like shoes), they’re going to expand a little bit once they’ve been worn in. Stick with them and once you’ve given them a bit of work, they should fit perfectly. On the subject of perfect fits, we also like the wrist wrap, which not only does its job very well but does it very conveniently. In other words, these gloves are easy to get on and off, but once they’re on they stay on until you decide to take them off. A good pair of heavy bag gloves is an investment in your comfort and safety regardless of whether you’re training at home or in the gym. For those training in gyms which supply gloves, we’d still suggest getting your own pair as quickly as you can for two simple reasons. Firstly it puts you in control of what specific gloves you use and secondly it puts you in control of their cleanliness. Bluntly, heavy bag gloves are like workout shoes, they get sweaty and given how affordable even the higher-end gloves are, we’d say that’s a very strong argument for getting your own.